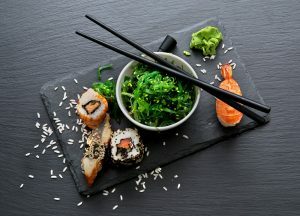 The thought of eating seaweed might seem unpleasant to you until you consider that seaweed is a common ingredient in foods you love like sushi, soups, and smoothies. It has been a staple ingredient in Asian cuisine for centuries, but is only now catching on in the West. Seaweed has been touted by health professionals as a “super-food,” but what about it makes it so good for you? Let’s take a closer look at some of the main health benefits of regularly incorporating seaweed into your diet. The combination of vitamins and minerals in seaweed is unique and can play a big role in obtaining your daily values. Of course, different types of seaweed are higher in some nutrients than others, but in general, seaweed is a good source of fiber, magnesium, vitamin K, manganese, iodine, calcium, folate, potassium, iron, and copper. Seaweed is more iodine-rich than any other food, especially kelp and kombu. These are generally used to make stock for soups, but they can also be eaten dried or raw in moderation. Iodine is essential to a properly-working thyroid, which regulates the body’s metabolism. Seaweed can help prevent thyroid malfunction which often results in weight gain and other problematic symptoms. Seaweed contains a few key nutrients which are important for maintaining a healthy heart. Fiber, omega-3 fatty acids, and sulfated polysaccharides can improve the condition of your heart, reduce blood pressure levels, and guard against blood clotting. Also, studies have shown that those who take spirulina (a type of seaweed) supplements can lower cholesterol, blood pressure, and harmful triglycerides. Some plants like seaweed have flavonoids and carotenoids, which are antioxidants that ward off free radicals. This is a huge benefit since free radicals are strongly linked with diabetes and heart disease. Foods like seaweed that are low in calories but high in fiber can help you lose unhealthy weight. Fiber helps the body feel full after eating, which means that you can consume fewer calories without feeling hungry. Seaweed also contains nutrients which can regulate leptin levels and prevent fat formation. Thinking about adding some more seaweed to your diet? Though no one food is a miracle cure for disease or unhealthiness, incorporating nutrient-rich foods like seaweed into your diet is never a bad thing. One of the tastiest ways of doing so is by eating more sushi. During your time in Orlando, stop in at Shogun Japanese Steakhouse’s new sushi bar, Sakura. Our sushi chef hand-rolls sushi and prepares nigiri and sashimi every single night. All classic rolls are only $5 every day between 5 p.m. – 7 p.m. for Sushi Happy Hour. Call 407-352-1607 for reservations.